Shafie being welcomed to the Pondok Payung Bersepadu (OPD) by Peter during the walkabout program. 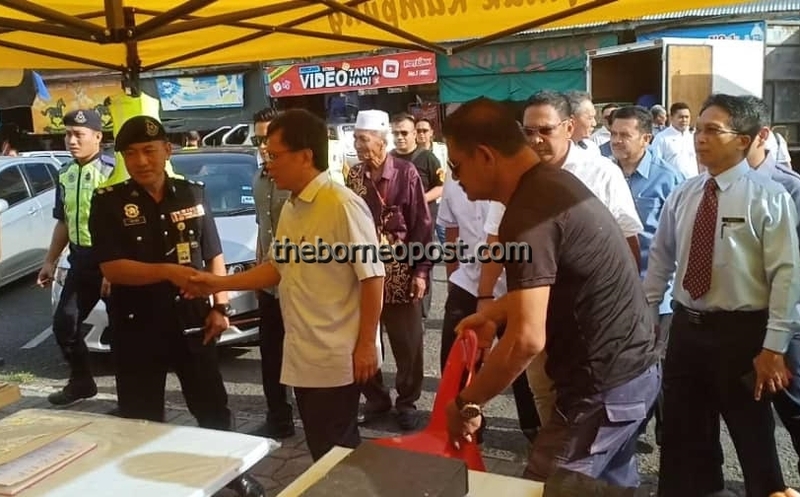 SEMPORNA: Chief Minister Datuk Seri Mohd Shafie Apdal today calls on the community not to shame the district as a dirty town. Shafie called on all the villagers and water villagers to stop the practice of throwing their rubbish into the sea. He also calls on parents to teach their children to properly manage their rubbish instead of throwing it into the sea, as this will destroyed the marine habitat. The calls was made during a random walkabout program this morning. The walkabout started at Al-Rahman Mosque followed by food stalls and then Pondok Payung Bersepadu (OPD). He was accompanied by district officer Bianus Kontong, district police chief Supt. Peter Umbuas and other head of departments.